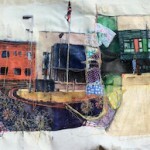 ‘Ysbyty Rookwood, canrif’ was a commission Haf received from Cardiff and Vale University Health Board. 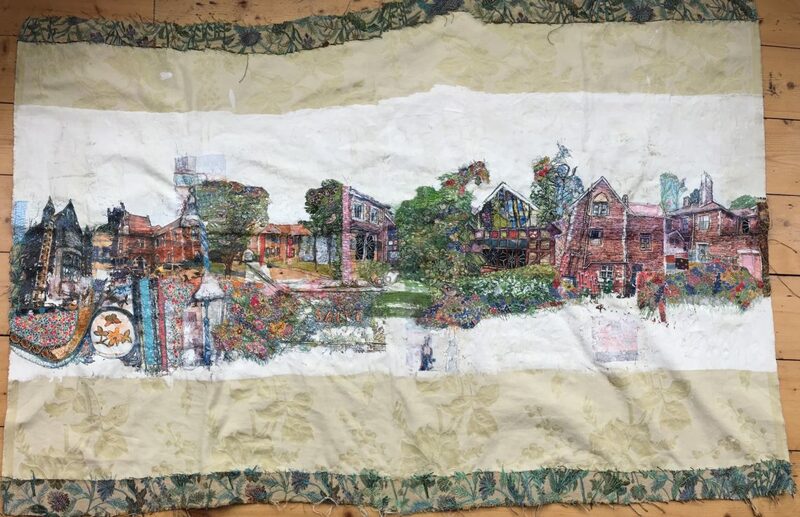 She was selected in 2018 to create a piece marking the centenary of Rookwood as a rehabilitation hospital. What she noted in early sketches and observations of the place was that both patients and staff have a very strong emotional connection to this hospital – its buildings, artefacts and surroundings. The institution, set within the grounds of an old gothic manor house has many unusual architectural features. The building is surrounded by extensive grounds that are often frequented and nested by Rooks – the inspiration behind the hospital’s name. 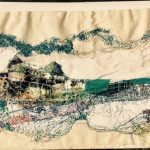 This piece was shortlisted for the contemporary Embroiderer of the Year Award at The Knitting and Stitching Show in Kensington Olympia in March 2018. Haf has strong connections with the media. She will work with your PR team to raise the profile of your commission through social media activity as well as through publishing press releases to target print media.